Well, as every six months, the OpenBSD team releases a new version of their operating system. It is known to be (one of) the most secure and reliable operating systems avalaible, mainly used in servers (but some folks might want to run it as their desktop, day-to-day system). The 4.0 version, programmed for November 1st, has a lot of improvements, and a new packaging : the CD case is like a DVD one now. 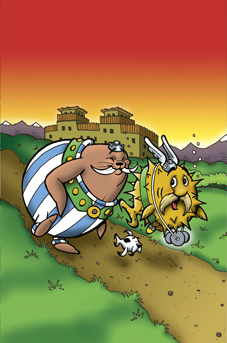 Beside that, I don’t understand why they don’t get sued by the owner of “Astérix & Obélix” , Albert René Editions, as the OpenBSD 4.0 artwork looks like it. Weird. As usual, you can order a CD set and/or make a donation to the project. I first wanted to include the previous post in this one, explaining how I went to reinstall Ruby and have all those troubles, but I splitted it in two parts, as it was two different (but linked) stories. Then I downloaded the gems (0.9.0), ruby setup.rb it and rand the gem command. I browsed and found that my Ruby installation was probably broken at some point, because I had to be in the gem directory to run the command successfully. Asking irb (and checking Ruby on anamorph’s box) confirmed what I feared : site_ruby/ wasn’t in the default $LOAD_PATH. So I set it manually in order to install Rails and its dependencies, but still looked for a way to fix it. Yesterday evening, after hours of searching, trying, looking at the configure, and Ruby and gems documentation, I asked on #ruby-lang on FreeNode. drbrain helped me explaining it should be the shell that the ./configure run in to be the problem. As export CONFIGURE_SHELL didn’t helped, I ran ksh (which was previously the root shell) to configure and compile the latest snapshot. Yeah ! Finally it works ! Thanks a lot drbrain This post coul have been titled “Last night a chatter saved my life” The $LOAD_PATH was fine, I reinstalled the gems, then Rails. So, to conclude, I gonna change the root shell from bash to ksh. I don’t know yet what’s wrong with bash and configure, but I learnt that even the shell can turn a simple installation into a nightmare. Not only I had a weird week-end, but I also crashed my OpenBSD box. I had about ten computers at home for a while, but living in a 310 squared feets flat, I had to get rid of some (even if most of them were Pentiums II, and I *love* Pentiums II). Now I have one box, with a cute three screens display, running OpenBSD, which I work on daily, a silent PII box waiting for an OS to be my dedicated test server, an old Power MacIntosh 4400/160, waiting for better days to recover from its NetBSD experience, and I brought home three PIIIs my company was about to throw away. So, it’s like if I had only one computer. which extracted the sources from the root directory, replacing /bin/ls (for example) by its source directory /bin/ls/. The computer was still running, but I knew it wouldn’t boot. I went to bed, wondering how to quickly make my system usable. I installed the latest release the day after, experienced a funny problem with xorg (my /etc/X11/xorg.conf file was replaced by a snippet of a game C sources), to finally go back to the version I ran. I spent the whole Sunday compiling Java (to run Eclipse) and KDE SDK (to get Umbrello). A colleague played with his Sony mobile camera. Jérôme and I were straight in the shot. It looks like we’ve just signed a contract to put OpenBSD on all our customers computers.